……..well, hardly. 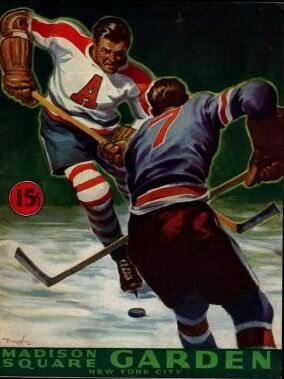 But at the end of the 1941-42 NHL campaign another pro shinny franchise bit the dust! They were called the Brooklyn Americans. That is seldom true of hockey franchises which fail, and attempt to rise from their ashes in a new venue. The checkered history of the WHA is evidence enough. But the game’s prime circuit cannot forget some of its own fraternities which transferred to new environs, and sooner or later fell by the wayside. The Ottawa Senators (St. Louis Eagles), the Pittsburgh Pirates (Philadelphia Quakers), the California Seals (Cleveland Barons), and Kansas City Scouts (Colorado Rockies) are prime examples. However, with the New York Islanders having been airlifted to Brooklyn, another attempt to prop up an NHL sextet comes readily to mind. The New York Americans occupied the league’s original stage in the Big Apple. When the Hamilton Tigers went on strike for more pay for extra games in the spring of 1926, the players were suspended (and fined the very amount they wanted as a bonus--$200.) By the time the first puck was dropped in the fall, they were sporting the star-spangled sweaters of the Americans. For the next decade and a half the team had more downs than ups in every way—including the stats columns. They made the post season but five times, and never competed for the Stanley Cup. Financial woes began to plague the franchise in the mid 1930’s with “Big Bill” Dwyer’s bootleg business waning. In 1936-37 the league took control of the franchise, with “Red” Dutton as C.E.O. as well as being manager and coach. Yet money problems still dogged the fraternity, forcing Dutton to sell off some of his better players. Finally, one last-ditch stand was attempted—moving the Amerks to Brooklyn. Actually, they merely changed the team nickname to “Brooklyn Americans”. But it’s likewise ironical that the Brooklyn Americans played their home games in New York’s Madison Square Garden, while the New York Islanders now call the Barclay Center in Brooklyn their home arena. Again in 1939, at the very grass roots—majority owner “Red” Dutton—forged plans to move the squad to Brooklyn. Feeling that his franchise was receiving second class treatment from the Garden, he had already arranged for tentative financing, to the tune of seven million dollars, the carry out his dream. But the outbreak of World War II, which caused building supplies to become limited, sidetracked the project. In the back of his mind he conceived naming the contingent the “Dodgers”, borrowing from the success the baseball team of that name had already known. When the move did take place in November of 1941, despite playing their home matches in Manhattan, he himself had already moved to an apartment across the river, and several team members had followed suit. Practices would take place at the Brooklyn Ice Palace. The opening night ceremonies on November 13 was a gala event, with a 60-piece band entertaining the spectators, and the president of the borough of Brooklyn throwing out the ceremonial dropping of the puck. Unfortunately, the visiting Blackhawks rained on this parade as they did for the grand opening of Maple Leaf Gardens on November 12, 1931—and by the identical 2-1 score at that. Simply losing was not the main issue. The match against the Boston Bruins on November 27 was a perfect example. As one newspaper put it: “Close game turns into a rout!” They had battled back in the third frame from a 2-1 deficit, with Thurier potting a goal at 11:58 to knot the score. But in Overtime—which was NOT “sudden death” in those days, the Beantowners fired four markers past the bewildered Earl Robertson for a 6-2 victory. Manager “Red” Dutton, already on pins and needles from the suspense of the tense finish of the third period, leaped into the ice after the initial tally of the extra 10 minutes, when he was dead sure Bobby Bauer was offside. Heading toward linesman Stevenson like a railway locomotive, he ran right into referee Lambert. He seized his sweater and shook him like a rag doll, resulting in the levying of a $100. fine. His temper was barely soothed because of this confrontation, when the Leafs socked it to his troops 8-2 and 5-1 just two and three nights later. In desperation Dutton made changes on December 2nd, demoting goalie Earl Robertson (whose “line score” was 3-8-1), “Peanuts” O’Flaherty, and “Red” Heron, replacing them with future Hall-of-Fame” netminder, Chuck Rayner, as well as Norm Larson and “Bus” Wycherley. There was no immediate improvement. In fact they dropped the next six contests — then won three of the following four. Two of them were victories by identical scores less than a week apart. Against Detroit, following the longest NHL losing streak in half a decade, their tally in overtime had “horseshoes” written all over it. 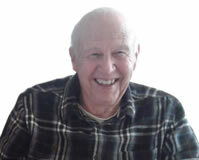 Fred Thurier passed the disc from behind the net, which hit Bill Jennings skate blade and bounded behind Johnny Mowers. What is ironical is that Wing’s tying marker went in the same way, deflecting off Pat Egan’s number 12’s. Brooklyn 4 Detroit 3. That same day Art Chapman was handed the coaching reins of the Amerks. Dutton had been fined for the third time for his tirades, and felt discretion was the better part of valour. So theoretically Chapman was to be the bench boss for the duration. If a hint of skepticism seems evident in the word “theoretically” it is because NHL “coaching records” do not list the former player in that category. In fact, in a little more than a month the rollicking redhead was beating a path behind his crew again. By this time the Broadway contingent was being hailed by newspapers as “the bums”. But against the Blackhawks, Chuck Rayner kept baffling the attacking Windy City gang, while the “bumeraks” prevailed, coming from behind in the final swing of the seesaw battle. Dutton’s sextet had scored two, gone behind 3-2, then dug down to match Chicago and go ahead by one. They travelled the comeback trail the next time they faced the Motor City marauders on January 8th. This time they were down 3-1 and rebounded with four (against one) to secure a 5-4 win. Ten days later they rubbed salt in the Red Wings wounds by whipping them 5-3 on their home pond. It was a matinee affair, with the Brooklyn-ites cashing in with three second period tallies to put the game out of reach. This was after his Americans were “blasted off the ice”, by that lop-sided count. With a (ping pong) table set up on a trunk in the Garden, Dutton worked off his anger with Coach Art Chapman. “Those Rangers are good. But not so gosh awful good!”, he moaned. The rest of the regular schedule continued with an occasional triumph. The most satisfying was their sweet revenge against their Broadway rivals. On February 15 they came out on the good end of a 5-1 score. Norm Larson was the star with a goal and two helpers, while Murph Chamberlain in his debut with the club snapped one behind “Sugar Jim” Henry, “scoring one for his new boss”. They managed but two victories after that, in the last 2-pointer doubling the score on the Maple Leafs. Unfortunately they closed out the campaign with an 8-3 drubbing at the hands of the Bruins. An identical count on had been recorded on February 28th in Montreal, where their constant rival for the league cellar got the better of them. But the Bruin debacle spelled “finis” to their playoff hopes—and indeed to the history of the franchise. They finished dead last, four points behind the struggling Habs. Dutton made surprisingly few moves to take up the slack over the 48-game schedule. Apart from the aforementioned shift with demotions and recalls, he sold the aging “Busher” Jackson to Boston for cash; bought Jack Church; and swapped “Red” Heron to Toronto for Murph Chamberlain. However, three future stalwarts made their debut with the hard-luck sextet. Chuck Rayner, Harry Watson, and Kenny Mosdell went through their baptism of fire during the Amerk’s swan song. In fact, it is interesting that while the Boston Bruins, the only other club to be partial to white shirts for both home and away games, wore a plain gold alternate with “Bruins” in script in some contests against them. However, in an accompanying photo with the report following the February 1st game, both Boston and Brooklyn are in white. It must have been interesting both for players and spectators to make quick distinctions. The most positive note emanating from the otherwise drab campaign was Tommy Anderson winning the Hart Trophy, signifying the “Most Valuable Player to His Team”. This was one of rare instances where the choice resulted from and honest assessment of “where would the team have been without him?” Al Rollin’s choice in 1954 was based on the same criteria—rather than usual “best player on the squad”. Anderson was 10th in league scoring with 41 points. Only “Sudden Death” Mel Hill also made the elite “top 25” in the point parade. 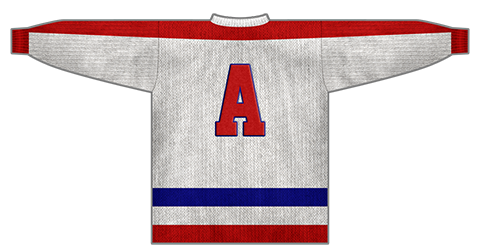 When the league governors met for their annual meeting on May 15th, President Calder was instructed to negotiate with Madison Square Garden to secure a lease for the Americans for the 1942-43 season. However, when the semi-annual pow-wow convened on September 28th, it was reported that the Garden had declined to renew the lease. There remained no alternative but to suspend the Brooklyn operation for the season. Vague promises were made that when the war ended the dormant franchise might be revived. Meanwhile, Jack Dempsey, who arrived in Montreal on November 28, 1945, sought out Dutton to meet with him about a plan to gain the charter of the idle franchise. He was there to referee a wrestling match, and revealed his hope to build a large mid-town arena in New York to house the restored team. It goes without saying that nothing came of it. When 1946 rolled around, with peace time prevailing, the return of the Americans was not to be. Although three owners, those from Montreal, Chicago, and Detroit were in favour of bringing the fraternity out of mothballs, they did not constitute a majority, and any future hope for Dutton’s club went down the drain. “Red” blamed the Rangers powers-that-be for swinging the vote, revealing that their philosophy was that the dates used up by the Amerk’s 24 home games could be better used financially. The fiery redhead jumped up at that point in the meeting, told them they could stick their franchise, and left! It is hardly surprising that with this move, which he considered a betrayal by his NHL peers, he also resigned as league president.